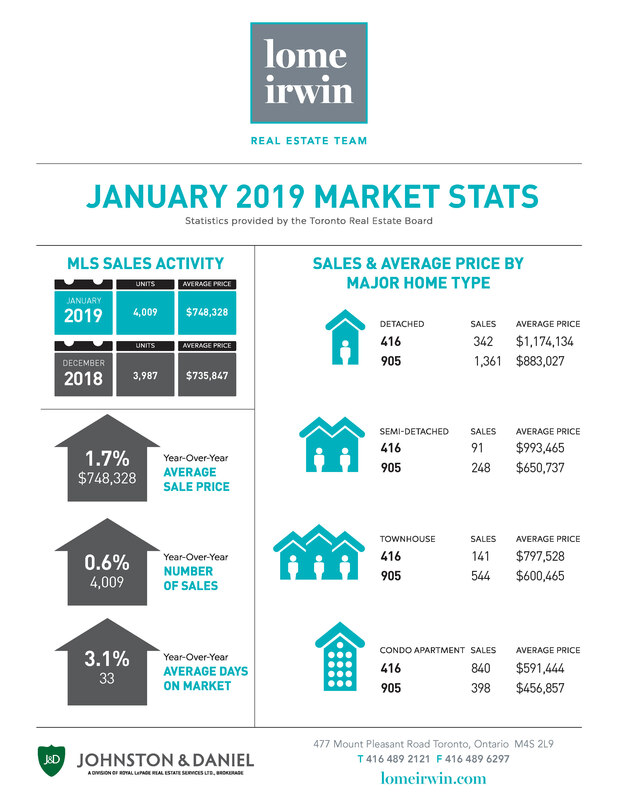 TORONTO, February 6, 2019 – TREB President Garry Bhaura announced that Greater Toronto Area REALTORS® reported 4,009 home sales through TREB’s MLS® in January 2019 – up by 0.6 per cent compared to January 2018. On a preliminary seasonally adjusted basis, sales were up by 3.4 per cent compared to December 2018. “It is encouraging to see the slight increase in January transactions on a year-overyear basis, even with the inclement weather experienced in the GTA region during the last week of the month. The fact that the number of transactions edged upwards is in line with TREB’s forecast for higher sales in calendar year 2019,” said Mr. Bhaura The MLS® HPI Composite Benchmark price was up by 2.7 per cent compared to January 2018. The condominium apartment market segment continued to lead the way in terms of price growth. The average selling price was up by 1.7 per cent on a year-over-year basis. After preliminary seasonal adjustment, the average selling price edged lower compared to December 2018. “Market conditions in January, as represented by the relationship between sales and listings, continued to support moderate year-over-year price increases, regardless of the price measure considered. Given housing affordability concerns in the GTA, especially as it relates to mortgage qualification standards, we have seen tighter market conditions and stronger price growth associated with higher density low-rise home types and condominium apartments, which have lower average selling prices compared to single detached homes,” said Jason Mercer, TREB’s Director of Market Analysis and Service Channels.